One hundred percent naturally derived Qsilica Paw Paw RESCUE Ointment has won a prestigious natural beauty accolade at the annual Janey Loves Platinum Awards in the United Kingdom. Organic and Natural beauty expert Janey Lee Grace has named Qsilica Paw Paw RESCUE Ointment joint winner of the Skin Saviour category in the awards; a reader-nominated who’s who of authentic natural beauty products, supplements and treatments. It is the second award bestowed on the product in as many years. It was named winner of Best Lip Balm in the UK’s Beauty Shortlist Awards in 2014. The award-winning ointment contains 50mg/g of fresh fermented paw paw, a therapeutic ingredient that has been found highly beneficial for wound healing and to promote smooth skin. Australian-made and vegetarian-friendly, the multipurpose ointment is free of petrochemicals, parabens, artificial colours and fragrances, making it an ideal candidate for the Platinum Awards, which celebrates effective natural and organic brands from around the world. The natural formulation includes the brand’s hero beauty mineral, colloidal silica. Shea butter, beeswax, macadamia oil and calendula extract are used to protect and naturally seal in moisture, while still allowing the skin to breathe. Qsilica Paw Paw RESCUE Ointment does not contain petroleum jelly. Instead, sweet almond oil is used as a carrier—an emollient known to soften and re-condition the skin. Manufactured from the dried kernels of the almond tree, it is a good source of antioxidants, Omega3 fatty acids, Vitamin E, magnesium and calcium. FERMENTED PAW PAW Fermented paw paw (or papaya), when applied topically, has been found to promote wound healing. Researchers believe the proteolytic enzymes chymopapain and papain in papaya are responsible for these beneficial effects. Rich in vitamins A and C, these nutrients are naturally nourishing, with an ability to moisturise and build collagen respectively. COLLOIDAL MINERAL SILICA Derived from quartz crystal, the hero ingredient silica is one of the body’s essential nutrients for strong and vibrant connective tissue—the foundation of healthy skin, hair and nails. However, silica naturally depletes as we age, therefore, applying it to the skin and topping up the body’s reserves internally with a silica supplement (available from Qsilica) may help. Family-owned Planet Health launched its award-winning hair, skin and nails brand, Qsilica in 2006. Formulated to promote beauty from the inside out, the range comprises supplements and skincare products. In 2012, the Qsilica Skincare range was commended in London’s inaugural FreeFrom Awards, with the Remove MakeUp and Grime Cleansing Gel claiming Gold and Overall Winner in the face and skincare categories. 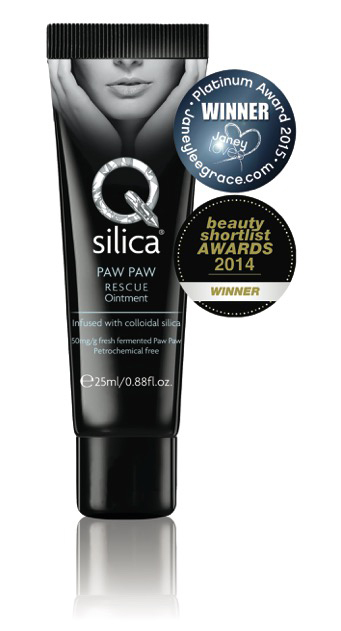 In 2013, a selection of Qsilica Skincare products was again commended in the awards, with the Paw Paw Rescue Ointment shortlisted. Meanwhile, the Qsilica One-A-Day Tablets jointly received the ‘Best Supplement’ in the annual Janey Lee Grace Platinum Awards, which celebrate quality and integrity in the natural health industry. Qsilica Naturally CLEAR is the latest product line to join the popular internal and topical ranges, which are formulated with the brand’s hero ingredient, colloidal silica. Qsilica products are proudly Australian made with premium ingredients and are 100% quality guaranteed. The entire range is vegetarian-friendly with no animal testing.